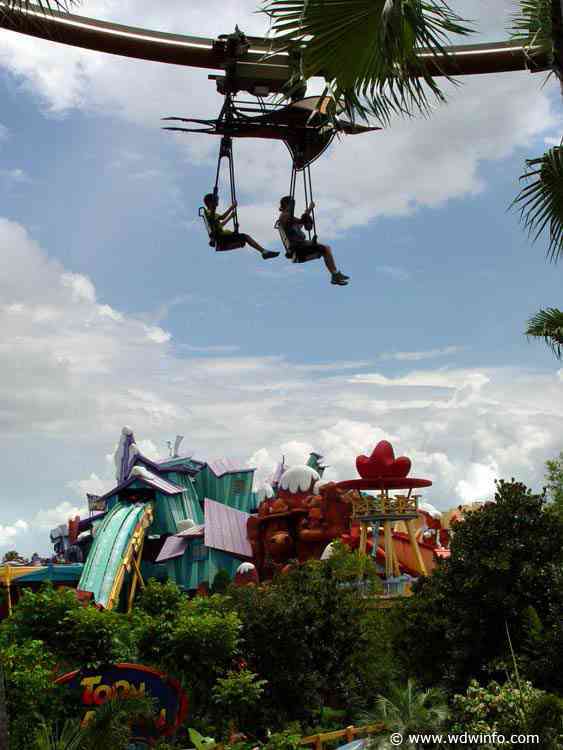 Pteranodon Flyers is a unique, single rail roller coaster inside Camp Jurassic that has an interesting catch to it. In order for an adult to enjoy Pteranodon Flyers, a child who is taller than 36 inches, but less than 56 inches, must accompany them. If the birds are too heavy, there is a safety concern that they could flip. However, once you are on the slow-loading ride, there are some spectacular views of Jurassic Park and Islands of Adventure. No loose articles are permitted on this attraction. Guest must transfer to ride's seating from wheelchair. Minimum Height Requirement: 36" (91cm). Maximum Height Allowed: 56" (142cm).